Golden Oak is pleased to introduce the two new custom homes available in Kingswell. Inspired by the Floridian climate and lush landscape, the homebuilders describe their unique approach to creating memorable gathering spaces for family and friends. Ohana. "We wanted to create the sense of harmony one experiences at a sophisticated island resort," said Rial Jones of Jones-Clayton Construction as he describes his latest Island Colonial home. "With views of the nature preserve, the space naturally lends itself to a tropical-island style." With a generously sized open floor plan and abundant windows, the home exudes a light, airy quality. Flashes of modern brilliance throughout the home like a glass wine room, an outdoor living area with a warm fireplace, and stunning views all make a profound statement. The master retreat boasts easy access to the outdoors with an en-suite bathroom featuring a 12-foot glass wall, adding to the grand serenity of this private space. "Resort-quality details, a water-blue color palette, well-planned focal points—these all come together to convey a sense of casual elegance while still very dramatic," Jones said. Monterey. 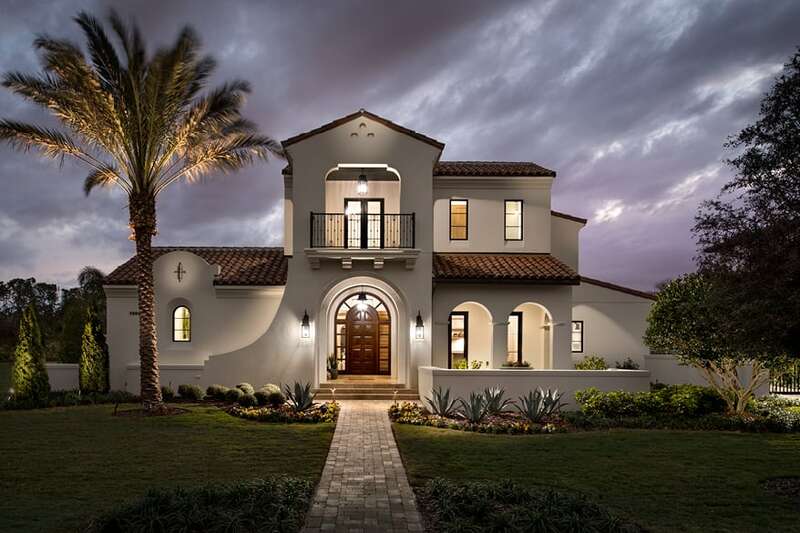 "I like to think of it as sculptured architecture—everything about it is substantial," said Derrick Koger of Derrick Builders, speaking of his newest Spanish Revival home in Golden Oak. 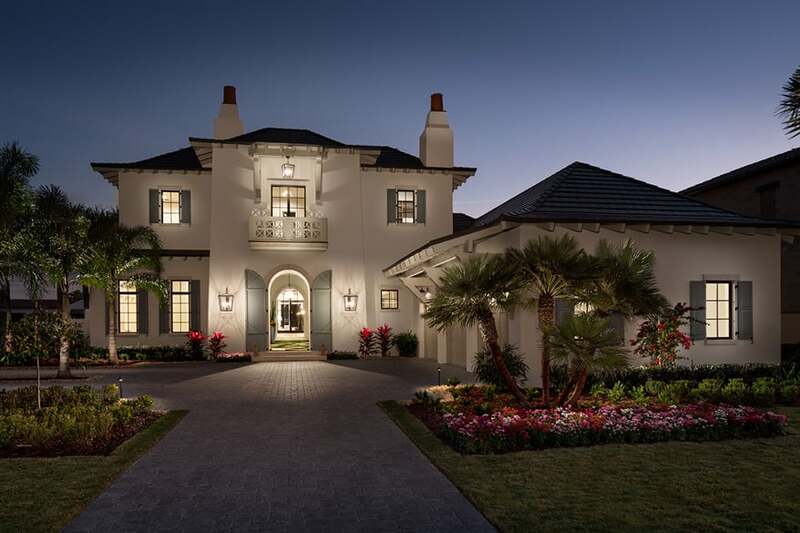 With timeless design elements, Monterey gracefully blends European character with serene, transitional interiors. Family-oriented at heart, Monterey's main gathering areas share one breathtaking open space. And with three bedrooms on the main level each opening to cozy courtyard spaces and three bedrooms upstairs, there are plenty of quiet "destination areas" to enjoy. The home's courtyards create light-filled galleries offering a dramatic transition between the indoor and outdoor living areas. "There's plenty of garden, fountain, or fireplace views – and always another place to go to enjoy the home," Derrick said. "You leave grand rooms to go down grand galleries that set you up for more grand rooms." Grand rooms such as the master suite. Elegantly designed with 14–foot ceilings, picture windows and luxury finishes, this owners' retreat offers access to courtyard and pool area with ambient lighting, a fireplace and water views beyond. "Everywhere you turn is a remarkable discovery as the elegant details and views unveil themselves," Derrick noted. "The beautiful spaces simply sneak up on you." For more details about all of the available homes in Golden Oak, we invite you to explore the Home Availability section of our website. Golden Oak Development, LLC does not guarantee the obligations of builders who will build homes within the Golden Oak community. Golden Oak Development, LLC's approval or selection of any builder, the builder's performance, or statements made by the builder including those setforth herein shall not be construed as an endorsement, warranty or certification of any builder or the builder's performance.